Artisan print the old fashioned way We are a traditional artisan letterpress studio situated a very short walk from the Cathedral Quarter in Derby. We have combined our love of typography and design with our commercial experience to explore the craft of letterpress print using antique presses, original type, beautiful papers and hand mixed inks. 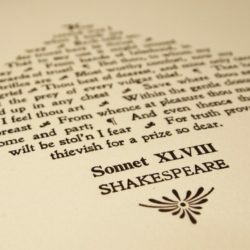 Letterpress requires a great deal of patience and dedication to the task and the results speak for themselves, with a luxurious, tactile finish. We love nothing more than to collaborate with people on a letterpress project; we hand print wedding and business stationery and paper goods on our vintage presses combining traditional metal type and modern techniques. We offer regular workshops both at our studio and off-site for beginners as well as more experienced printers. We also have an exhibition space, a little print-dedicated shop, offer room hire for creative activities and meetings, attend events. We love letterpress! Letterpress, design and illustrations Hand mixed ink, vintage letterpress machines, luxurious papers, hand finishing and binding.